The Rev. Dr. Joseph Lowery came to public attention again when he gave the eulogy at Coretta Scott King’s funeral in 2006 and more recently when he delivered the benediction at Barack Obama’s Inauguration, January 20, 2009. However, Lowery has never been far from the public eye as he has been a civil rights activist since the early 1950’s. Long considered “the dean” of the Civil Rights Movement, in 1957 with Martin Luther King he co-founded the Southern Christian Leadership Conference (SCLC). He led the delegation which delivered the demands of the “Selma to Montgomery” marchers to Alabama’s Governor George Wallace in 1965. Born October 6, 1921 in Huntsville, Alabama, his early childhood, as an African American, included confrontations with prejudiced neighbors, abusive police officers and the KKK. These experiences shaped his social conscience. He attended Wayne State University, Payne Theological Seminary in Ohio, and earned a doctorate at The Ecumenical Institute in Chicago. He married Evelyn Gibson, a civil rights activist in her own right, and graduated from theological school in 1950. Ordained into the ministry, he was appointed to a United Methodist Church in Mobile, Alabama. In the early 1950’s, he headed the Alabama Civic Affairs Association which was devoted to the desegregation of buses and public places. 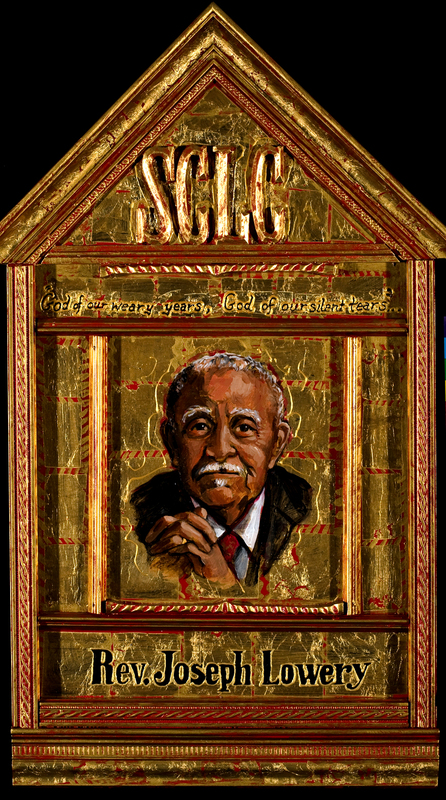 Along with Ralph Abernathy and Fred Shuttlesworth, Lowery was sued by the state for libel. They were ordered by the court to pay $3,000,000. In lieu of cash, however, their cars, homes and bank accounts were seized! The U.S. Supreme Court reversed the suit and their property was returned. After Rosa Parks’ arrest, Lowery joined King in leading the Montgomery Bus Boycott. Following the success of the boycott and as a way of providing sustained leadership to the Civil Rights Movement, the SCLC was formed. Lowery was its first vice president and then president from 1977-1997. This organization did not occupy all of his time as he continued to serve thriving churches in Alabama and Georgia. In Atlanta he became pastor of the oldest and largest predominantly black United Methodist Church in the city. During these years he spearheaded the 1990 visit to Atlanta by South African anti-apartheid leader, Nelson Mandela. Lowery also implemented his vision of economic justice with the construction of a 240 unit housing complex for low and moderate income families in Atlanta.